Polyanthus have elegant long stems that protrude from the distinctively textured foliage. They are a large and varied group of Primula, characterised by their bright, blazing colors. A cottage garden classic, they will survive the winter, peeping out in the early spring as a sign of new life after the gloom of winter. Polyanthus flowers appear singularly, clustered in a rosette at the base. Some varieties also grow on long, stalked umbels. Where did Polyanthus originate from as a distinct flower? They are thought to be a natural hybrid between the Common Cowslip (Primula veris) and the Common Primrose (Primula vulgaris). The resulting hybrid was called a “False Oxlip”, and it began to be appreciated for its own showier flowers. The word “Polyanthus” began to be used in the 1670s, with a labelled illustration first appearing in a plant catalogue in 1687. Polyanthus plants prefer a moist yet well-drained soil. For autumn bedding, plant out your plug plants from mid September to early October, depending on the size of the plants acquired. Grow on plants indoors until they reach 3.2 to 4 inches (8 to 10 cm) in height at which point they’re ready to plant out. To plant in a container, fill the pot or basket up to three-quarters full with multipurpose compost. Carefully remove the plant from the tray or pot and place in position. Fill the container back in with soil and gently firm down. Water in generously. For open planting, dig a hole with a trowel to the same size as the plant’s root ball, and place the plant in position. Fill in the hole and gently firm down the soil. Water immediately; leave a 4 inches (10 cm) gap between plants. Plant your Polyanthus plants so that their crown is at soil level. Water when necessary, but remember that compost in potted plants can dry quickly in winter winds. 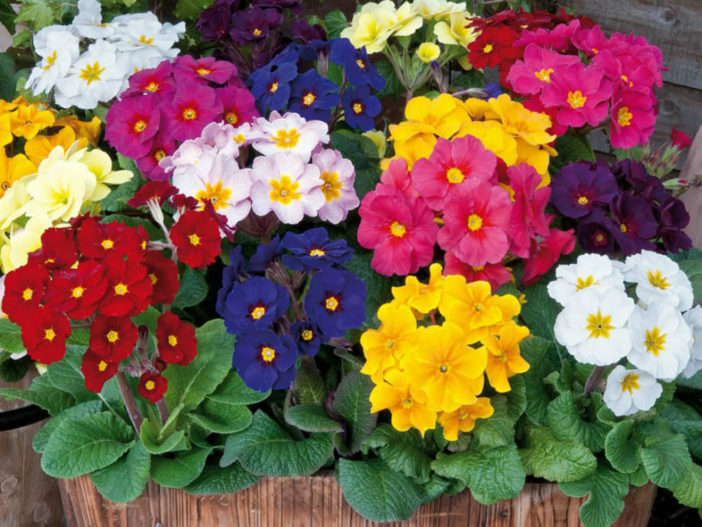 Generally, Polyanthus flower in the spring and flowering time can vary depending on weather conditions. After a very harsh winter, the flowering may be slightly delayed, whereas a mild winter encourages earlier flowers. Look after your Polyanthus by removing any yellow leaves as they appear, and snipping off any dead heads with secateurs to keep the plants looking neat. After flowering, the plants can be lifted and moved or left to naturalize. One variety of Polyanthus which particularly attracts bees and butterflies is the Primula elatior ‘Gold Lace’ a historical gem which dates back to the 1780s. It is instantly recognizable from its golden-eyed flower with black petals. Over the centuries it has gone in and out of favor, but its unusual flower patterns are currently high in popularity as they were in the Victorian period.